Marvel Comics is excited to announce the new group of Earth's Mightiest Heroes taking over an all-new era with Marvel Comics' A-FORCE co-written by G. Willow Wilson and Marguerite K. Bennett with artwork by Jorge Molina. "She-Hulk, Dazzler, Medusa, Nico Minoru and other fan favorites, will take charge," says series co-writer G. Willow Wilson. "We've purposefully assembled a team composed of different characters from disparate parts of the Marvel U, with very different power sets, identities and ideologies." *hyperventilates* She-Hulk, Dazzler, Medusa, and Nico all on a team together? This is everything I never knew I always wanted! Medusa is a fan favorite? News to me. I think she counts. The OP is clearly excited, for instance, and I'm surprised, out of all those characters on the cover, she's the one you question being a fan-favourite, heh. I thought the definition of 'fan favorite' was a character people like, but editorial does not think can hold their own book. I'll believe that Hellcat, Gwen Stacy: Spider-Woman , etc.are fan favorites, but Medusa has had plenty of exposure. More power to her and her fans, I guess. I think that's what you'd call an 'Ensemble Darkhorse', at least if you're a Troper. I think 'Fan Favourite' would mean more like 'character that fans squee when they see them'. Not sure if Medusa counts as that though. I have a feeling after the Inhumans Movie she might be. She was pretty great in that run of FF. In my case, reading Inhumans has actually turned me into a Medusa fan. I'm trying not to play a game of "where's my favorite obscure heroine," but I'm actually genuinely surprised not to see Kitty/Shadowcat there, given how often she seems to be the X-Men's main character. And I see both Rogue and Storm, so it's not like mutants are verboten. But hey, She Hulk! Dazzler! Bring it on. Personally I'm surprised by the lack of Kamala Khan. I am too. (Though apparently the image is not the definitive cast.) Given that G. Willow Wilson is on both titles, I have to think there will at least be a crossover. Yeah, I'm surprised at the lack of her; also puzzled by the lack of Kate Bishop, Mockingbird, Quake, Psylocke, X-23, and a bunch of other ladies I was hoping to see get some publicity, especially the first two on that since they've not been in much of anything for a while. I'm majorly excited for this. Plus, it looks like nearly all my faves are there. A sidenote: we also got some details on another region of Battleworld. Arcadia is apparently a 'feminist paradise'. I wonder if it's something based on a previous story or a whole new creation. I'm wondering if Marvel's idea of a feminist paradise will look anything like my own. Hmm, does Miss America's home universe have a name? Maybe the multiverse falling apart (or whatever is happening exactly) has somehow de-isolated it. Not that I think "feminist paradise" necessarily means an all-woman universe, but I'm not writing the thing. Apparently it's the "Utopian Parallel." Presumably if this feminist paradise is all-woman, they'd have used that name or else Femizonia. Looks like Nico lost her gauntlet arm from Arena. Though this picture might not be 100% accurate as Jubilee is all sparkly and not a vampire. Given the way the Battleworld stuff seems to work, they could all be pulled from different eras. Meaning Nico, Karolina and crew could be taken from before Hopeless' mess. Rogue's looking very 90's, for instance, while Carol is in her Captain Marvel outfit. Have fanboys started complaining "that's not diverse! reverse sexism!!" yet? My only concern is if all these characters will be shared with other books or if the rest of Marvel's titles join the He-Man Woman Haters Club while it's being published. Yes, they have. Mostly because of the misconception this is 'replacing' the Avengers, even though its clearly an alt-world thing. Edit: After reading more comments on Marvel's page for it, I now remember why I don't like reading comment sections. Seriously people, don't go there, there's only a few guys trying to ruin it, but they're really going all-out in trying to criticize this with the most inane criticisms. ... wait, Jean Grey? As Phoenix?? This can't be the actual team lineup. Some of these characters haven't worn these costumes for years (e.g. Monica Rambeau, Dazzler, even Spider-Woman). So I am not sure what Marvel is doing here, as there is a mix of classic and current characters on display. I do like that Shulkie has a prominent role! It's a Secret Wars title, so it makes sense the characters are pulled from different eras and worlds. This can't be the actual team lineup. Yeah, a cast of 26 would be a bit of a juggle. Actually I think the only characters who're confirmed on the team are the ones mentioned in the quote, plus a new character called Singularity (the woman made out of space on Shulkie's left). There will be others in the book (who are not necessarily from the cover there), but not sure who. 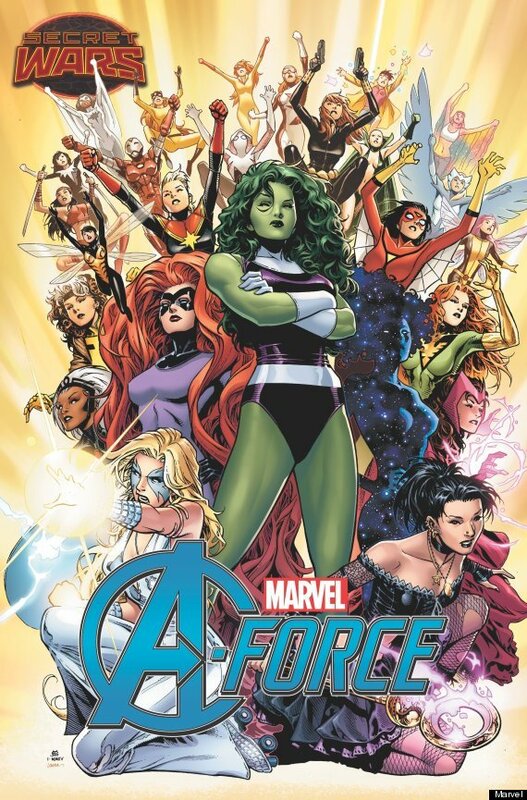 Okay, that's all well and good, but we can all agree that A-Force is a terrible name, right? The A-Men would have sounded even weirder... unless they were some sort of evangelical group. I can't wait for the post-modern A-Statix era. I knew it. I'm surrounded by A-holes! I can't wait to see the sales on this. It sort of makes for a great social experiment. I'm really curious to see how it pays off. I am REALLY surprised that Emma Frost is not on that image. But with Marvel trying to screw Fox over by giving the X-Men less prominence and force the Inhumans on us I guess it's t be expected. If there's been an X-Woman who's been a core player the last few years it's Emma (as well as Rogue and Psylocke). Not Storm, who has her own series? "But with Marvel trying to screw Fox over by giving the X-Men less prominence and force the Inhumans on us I guess it's t be expected. " 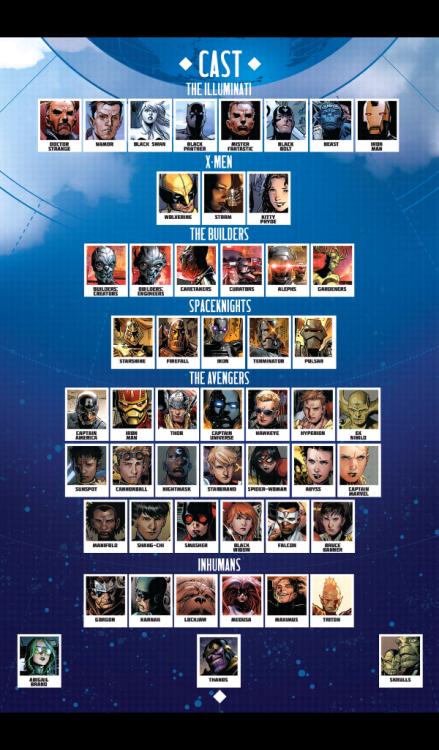 Over a third of the characters shown are X-Men-affiliated, while only one of them's an Inhuman. Emma not being featured doesn't change the fact that of the characters above, X-Men is the biggest one contributing characters. Hell, there's actually more X-Woman than Avengers-ladies there! I give Elektra one and a half panels before she quits this group. Phoenix-era Jean next to Wanda... has someone at Marvel been reading Waiting for the T? I love the ideal...I just hate the name. Gorrammit Marvel, why didn't you just resurrect the Fearless Defenders? That title ended with too many loose ends unresolved. Not really a fan of one gender base teams honestly though I am disappointed the Avengers are allowing more X-men members to the team don't they have their own little land to contend with in that 90's nostalgia of the X-men cartoon. As to Elektra and Spider-Gwen terrible choices. Wot, no Spider-Girl? If you have alternate Superheroines all on one team, why isn't the all-time most successful (sorry, Shulkie, sorry Carol, but Mayday got to 100 in one run) not there? Or has Marvel officially decided she no longer deserves to exist?